The wide Mokelumne River runs along the southern border of Amador County. 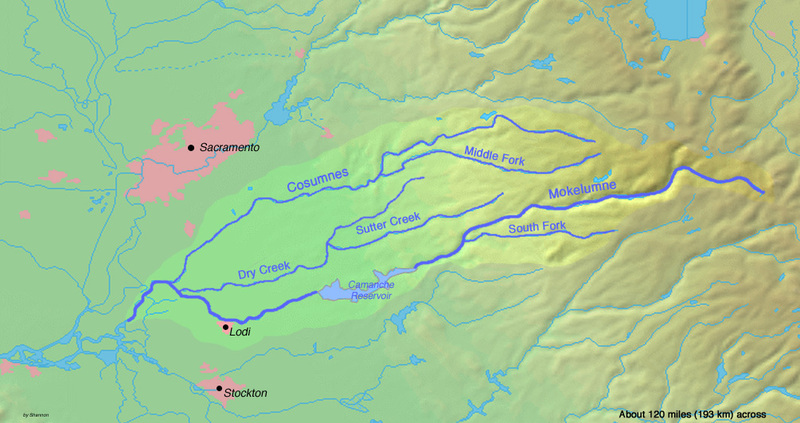 Eventually, all the creeks and rivers in Amador County (the Cosumnes River, Dry Creek, etc.) flow into the Mokelumne (see Wikemedia Map below). Today's bridge is the westernmost Mokelumne River Crossing in Amador County. The Camanche Parkway Bridge (30C0073) crosses the Mokelumne River at the upstream end of where the river is dammed to form the Camanche Reservoir (shown on the map below). It is a three span prestressed girder bridge that was built in 1964. The bridge is 400 ft long with a center span that is 150 ft long. The single column bents have big solid bent caps. The girders were set down on the caps (and on abutment pedestals) and a continuous deck was poured on top. Amador County, California Bridges: Camanche Parkway Bridge across the Mokelumne River by Mark Yashinsky is licensed under a Creative Commons Attribution-NonCommercial-ShareAlike 3.0 United States License.